Tired of the same old banana bread? 🍌 Bake up a batch of these Banana- Chocolate Chip Muffins instead! These deiciously - moist muffins are perfect for breakfast, snack or dessert! Today I wanted to bake up a quick snack for the kids. Last week I was thumbing through a new cookbook I received in the mail. 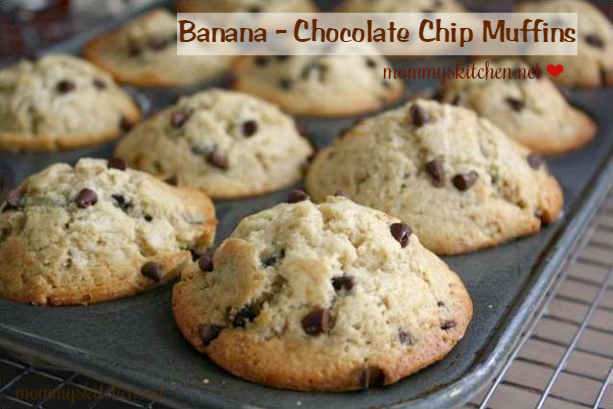 I came across this recipe for Banana Chocolate Chip Muffins. My little guy is a chocoholic as well as a muffin man so I knew this recipe would be perfect. Not to mention I had a couple bananas in my fruit bowl just calling my name. I had everything I needed in the pantry so it worked out perfectly. Look how high and yummy these muffins baked up. I literally had this recipe thrown together and in the oven in about 10 minutes. Don't you just love those kinds of recipes. I mentioned above that I received a new cookbook in the mail. Well besides the cookbook. I also received COOKIES!!!! A couple weeks back a Tate's Bake Shop asked me if I would be interested in sampling some of their yummy cookies. 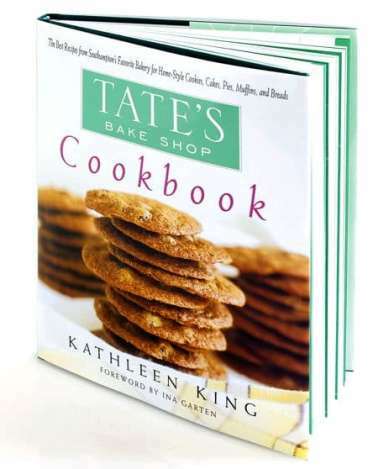 Included with the cookies was a review copy of Tate's New Bake Shop Cookbook. I said yes of course because who can turn down a good sampling of cookies. I had heard that the Tate's Bake Shop in South Hampton had some awesome goodies so I couldn't wait. I was so excited the day my packaged arrived. I ripped open the box like a kid in a candy store. Pulling the boxes out as I read each cookie flavor I was in heaven. Oatmeal Raisin, White Chocolate Macadamia Nut and Chocolate Chip. One of my favorite cookies is white chocolate chip with macadamia nuts. All of the cookies were crispy on the outside and buttery good on the inside. My favorite cookie by far was the oatmeal raisin they were crispy yet chewy all at the same time. The cookbook was wonderful and all of the recipes were home style cookies, pies, cobblers, cakes and muffins. There was even healthy alternative chapter consisting of recipe like, Energy Bars, Whole Wheat Quick Bread, Sports Bars and Multi grain Muffins. Be on the look in the next couple weeks for Tate's Cinnamon Swirl Bread and their Coconut Birthday Cake. The Coconut Cake has both buttermilk and cream of coconut, so I know it will be fabulous. Would you like to have some of Tate's Bake Shop Cookies? Well, I have a treat for you! 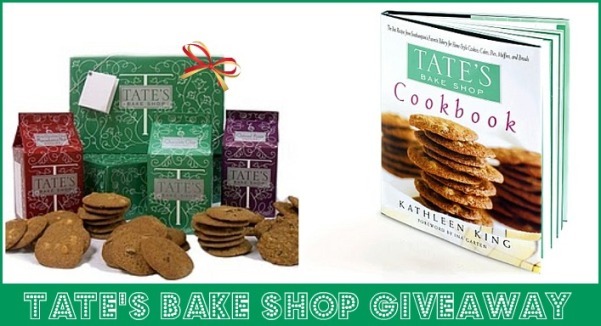 One lucky Mommy's Kitchen reader is going to win an assortment of Tate's Bake Shop Cookies as well as a copy of their wonderful cookbook. You will receive the following cookie flavors. Oatmeal Raisin, White Chocolate Macadamia Nut and Chocolate Chip Cookies. 1. Become a fan of Tate's Bake Shop on Face book. When you have done that, return to this post and leave a separate comment letting me know that you are now a fan of Tate’s Bake Shop. 5. Tweet this giveaway by using the re tweet button on this post. Come back and let me know you tweeted the giveaway. Before I go if you can't wait to try Tate’s Bake Shop cookies you don't have to. Tate's is offering all Mommy's Kitchen readers a 15% discount on any purchase from now through December 31st. Just go to Tate's Bake Shop and enter the promotional code "cookie" to get your discount upon check out. This discount is valid until December 31st. This giveaway will end at midnight (cst) on Saturday, January 1st 2011. At that time, a winner will be chosen at random using random.org and notified. Winner will have 48 hours to reply or a new winner will be chosen. If you do not have a blog please leave your email address in your comment in case you are the winner. Contest open to US Residents only due to shipping charges. As for these muffins they turned out really good. They even got my little muffin mans approval. Preheat the oven to 400 degrees. Grease a 12 cup muffin pan. Mix the flour, baking powder, soda and salt. Set aside. Cream the butter and the sugars until they are lights and fluffy. Add the vanilla and eggs and mix everything well. Mix in the bananas and sour cream. Fold in the flour mixture. Fold in the chocolate chips. Spoon the mixture into prepared muffin cups to about 3/4 full. The cups will be very full, but don't worry they wont spread over. Sprinkle them with sugar or more chocolate chips. Bake them for 20 minutes or until a cake tester or toothpick inserted comes out of the center of one muffin clean. Cook's Note: I wanted to note that I have had great results using one cup whole wheat flour + one cup all purpose flour, coconut oil and greek yogurt in this recipe. Disclosure: This post was sponsored by Tate's Bake Shop! I would like to thank Tate's Bake Shop for sponsoring this giveaway. My favorites are chocolate chip cookies and peanut butter cookies. But basically if it's a cookie I'll eat it!! My favorite cookies are white chocolate macadamia nut with snickerdoodles coming in a close second....YUM!!! I never met a cookie that i didn't love! But, if I had to pick one it would be Oatmeal Raisin. Yum! I became a fan of Tate's Bake Shop on Facebook. I am a Google follower of Mommy's Kitchen blog. I am a Cookie Monster, one of my favorites is Oatmeal Raisin! I am a fan of Tate's Bake Shop on Face book! I am a fan of Mommy's Kitchen on Face book! Raisin filled, you don't see those on to many recipe blogs, but I would share with you. I'm already a fan on FB and google reader. Now a fan of Tate's bake shop as well! fan of tate's bake shop. I love chocolate peanut butter no-bake cookies! They are the best!! Chocolate Chip is my facorite. But I like most cookies in general. Favorite Cookie: Oatmeal Banana Chocolate Chip. I'm a fan of Tate's Bake Shop on Facebook. My favorite cookies are the good old standby Oatmeal cookies! I mentioned this giveaway on my Facebook page. I've become a new Google Follower of Mommy's Kitchen. My favorite cookie is my homemade white chocolate, macadamia, and apricot cookies. I'm definitely taking advantage of the 15% off discount for Tate's cookies. My hubby's favorite cookie is oatmeal raisin. I just posted about your giveaway on my facebook. I love all cookies, but I am partial to chocolate chip. I'm already a follower on google and facebook friend of Mommy's Kitchen. I NEED COOK-IEEEE!!! I love your blog!! Thank you so much for sharing! I love chocolate chip cookies, the ones from the Doubletree hotels are truly the best! Became a friend of Tate's Bake Shop on facebook. I can't wait to try these cookies! Fave cookie has to be oatmeal with raisins. I am a fan of Tates bakeshop on facebook. l also a fan of mommys kitchen on facebook and been following your blog on google reader. My favorite cookie is a chewy chocolate/walnut chip cookie! My favorite cookie is oatmeal! I just became a new Google follower to Mommy's Kitchen. I just became a fan of Tate's Bake Shop on facebook. I love Russin Tea Cakes yummy!!!!! I also became and fan of Tates on facebook. looks YUMMY! I alos tweeted this contest... and I never knew before we needed to repost that we did! oops all the other contests, I never let you know, but I do all the ways to enter! Thanks for all the fun giveaways! And, just for good measure I posted this to my facebook wall!!! It's so difficult to just pick one but I'll have to say oatmeal chocolate chip cookies. Peanut butter is a close second though. Chocolate chip is by far my favorite. You are now on my fb page! I am most definitely a cookie monster! But my favorite cookie is an oatmeal choco chip that my mom made often when I was growing up. I'm already one of your fans at Facebook! I am now a fan of yours on facebook. Chocolate chip cookies are the bomb. I mentioned this on my face book page. My favorite cookies are Beth's Oatmeal Raisen cookies on Allrecipes. My favorite cookie is the white chocolate macadamia nut. Now a FB of Tate's!! My favorite cookie is gingersnap. I just shared your post on FB!! I love chocolate chip cookies. They were the first cookies I ever made and I love making them for my kids now. I became a fan of Tates Bake Shop on Facebook. I posted about this giveaway from Tates Bake Shop on Facebook. My favorite are sugar cookies!! Especially frosted ones! My favorite is chocolate chip, especially when they come out of the oven all nice and gooey, Yummy! Oatmeal. I love anything oatmeal! I like to make all kinds of cookies, but I think my favorites would be chocolate chip pecan. They're just so good hot out of the oven... Yum! Became a fan of Tate's Bake Shop on FB. Posted about your give away on my FB page. I'm already a Google follower. Great giveaway! I love cookies especially with nuts. My favorite has to be my mom's Noel Nutballs. I've had these before but never compare to my mom's. Yummy! My favorite cookies are most definitely white chocolate macadamia nut! They make me smile:) I also became a facebook fan of Mommys Kitchen. My favorite cookies are my great, great, great Aunt Katie's frosted sugar cookies. I am now a fan of Tate's Bake Shop on Facebook. I became a fan of Tate's Bake Shop on Facebook!! My favorite cookie is any kind with peanut butter. I LOVE PEANUT BUTTER and I love your blog!! My favorite cookies are oatmeal toffee. My favorite cookie is chocolate chip. I want to try the muffins. I make a orange chocolate chip muffin from a Hershey's cookbook that is my husbands favorite. I would love to win the cookbook and cookies. I am now a FB fan of Tate's Bake Shop. I am also a FB fan of Mommy's Kitchen. Love reading and trying your recipes! Cookies are my favorite food. My favorite? What else...Chocolate Chip. My favorite cookie is snickerdoodles. Full of goodness and memories. I love peanut butter cookies with minit chocolate chips! Oh.So.Good!!!! I became a fan of Mommy's Kitchen on Facebook. I prefer chocolate chip cookies. My favorite cookie is a Russian Tea Cake, followed by an oatmeal chocolate chip cookie! Mmmmmmm!!!!! I am now a fan of Tate's Bake Shop on Facebook!!!!! Love oatmeal cookies and the cinnamon bread is also a big favorite!! Your banana chocolate chip muffins look wonderful! I love chocolate chip cookies - they are my favorite. No doubt Peanut Butter Cookies!! My favorite this week is Oatmeal Raisin. I just LOVE COOKIES!! I did it... Im now a fan of Tate’s Bake Shop. Im now a new Google Follower! Frosted sugar cookie for me. I "LIKED" you and Tate's on FB. Hope I win! Already follow with Google RSS. I am a chocolate chip cookie freak. I have at least one every morning with my coffee. My favorite cookie is the Buffalo chip cookie. I love any kind of chocolate cookies. I have at least one kind every morning with my coffee. My favorite is a good ole peanut butter cookie. I am a fan of yours on facebook. Thanks for all you do. Peanut Butter cookies are my all time fav! I'm already of fan of Mommy's Kitchen! I re-tweeted your tweet about Tate's! I shared on my facebook page! Thanks Tina! Oatmeal Scotchies...mmmmm. Oatmeal Raisin....close 2nd! Any cookie with chocolate in it. How could I possibly choose just one flavor? I'm a fan of Tate on facebook. I love love love Martha Stewart's sugar cookies! I am a fan of Tate's on Facebook and in real life! I am a fan of Mommy's Kitchen and love to bake. OH MY OH MY!!! My favorite would have to be something ... oh no ANYTHING with peanut butter!!! I am a fan of the wonderful Tate's Bake Shop on Facebook! I am a fan of the oh so awesome Mommy's Kitchen on Facebook! I also retweeted your tweet.Just love your site! My favorite has to be chocolate chip! I've become a fan of both Tate's and Mommy's kitchen on facebook. I also retweeted this post as well. I am now a fan of Tate's Bake shop and Mommy's kitchen on facebook....I love your blog!! YUM! Those muffins look good! My favorite cookie is a crispy chocolate chip! I'm a fan of Tate's Bake Shop on Facebook! I'm a proud new Google follower of your blog! My favorite cookie is Chewy Chocolate Chip Cookies and Oatmeal...YUMM!